Me and my friend, although only in six grade, have experienced some issues with depression. It’s definitely not the biggest thing out there and we know that. I personally was reluctant in thinking I had depression, but it turns out she could be bi-polar and I might be at least somewhat depressed. She has told me years ago that I couldn’t be depressed cause I can be happy, and I believed it so much I think I pushed myself into more depression. But now she knows she could be bi-polar and I could be slightly depressed so we can either show a doctor or try and get better ourselves. Have a great day! i love ada so much. she tells me what’s wrong and gets it right every single time. 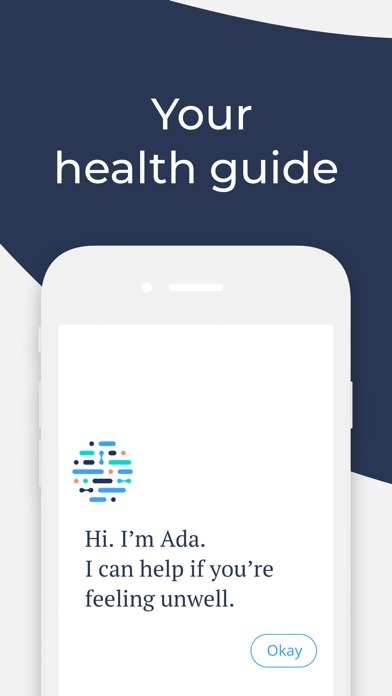 this is going to be a short review, but just know that i think ada is the best free medical app; even the best medical app in general! thank you ada team for making this wonderful app. i think that it would be nice to add a “sometimes” button and younger age options. again, thank you! I would suggest Ada would have photos in her symptom assessment. I am unaware if it has any capability of doing so if there is I would love to be notified on how to enable the option. But to continue, it would be lovely if her questions about pain had an image to help specify where it is directly pointing at. An example of a sort is if a person was in an important situation (pressuming they hadn't gone to get medical help) and had to evaluate someone of their symptoms to see if it was anything serious. They run into a question that ask if they have pain above the abdomen. If the person is unaware of what an abdomen is then it would lessen the time and make it slightly difficult for them to finish the evaluation. The option for images could also have certain sizes for the red pain marks. It could be more focused if Ada was asking for sharp pain, it could be more spread if Ada was asking for pain all around, or it could be a moderate size to show if Ada was asking for normal pain. Ada's post-evaluation sequence should show specific images and areas for the tumors she suggest that the symptom lead to or the bones that have been affected. Otherwise, the app is great always saved me the worry. (I still seek medical help if I'm sure it's serious or if my symptoms get worze) I recommended the app throughout my family and friends! Continue the great work. Excellent App for health care. 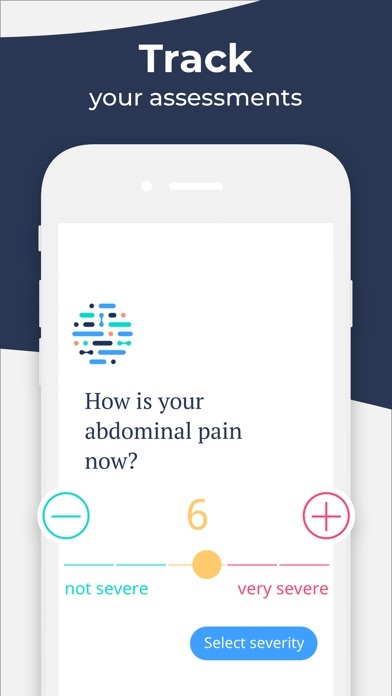 I like this app because it asks my questions based on my initial symptoms. This helps me realize symptoms I didn’t know were symptoms. It also comes up with several diagnoses and compares my symptoms to what other people with those conditions experience. Very helpful! I recently have been having various symptoms and I had no idea what they were linked to even after going to four different doctors (they all seemed knowledgeable but very vague), but when I installed Ada I was so relieved! It told me what the most likely cause(s) were of my symptoms and how to treat them! I feel like this app should come with every iPhone right out of the box because it is so helpful and (honestly) LIFE CHANGING! Great app! I highly recommend this if get sick often or just don’t feel great one day! No pay required!! Ada has been very helpful for me on multiple occasions. Very easy to use, and the questions seem to zero in on the likely cause quickly. I love that it doesn’t ask for money to get any actual results! I have never left a review of an app before, but I’m a hypochondriac and I have to say this app is better for me realistically and mentally. I typed the same symptoms for a strained muscle onto both apps, and WebMD indicated it was a serious chronic problem, even lethal if not treated right away, and Ada gave me the correct answer. It takes a lot of stress out of my life by giving the most realistic answer and also comparing it to people your own age and gender. I cannot express how much I am in love with this app! I downloaded this app to see what symptoms I had, since I was feeling nauseous and a headache three days prior to knowing Ada exist. When I created an account and got started on the assessment, the results were accurate and were great in correlation to what I put in. As I usually don’t put reviews, I feel like this app deserved it. So glad I opened this App . I’ve been feeling unwell . It ask me questions .. unlike Web MD it’s easier to understand and gives reasons and probability of what my condition could be . It Opened my eyes . I recommend #5 Star Rating . This is an excellent assessment tool. Very thorough questioning— asked certain questions I would have forgotten to ask. This would be a very handy study tool for medical/nursing students. I’d pay for this app if it weren’t free! This app is very accurate. I have had a lot of bad coughing lately, lots of sneezing, and my nose is blocked. When I found this app, I immediately installed it. 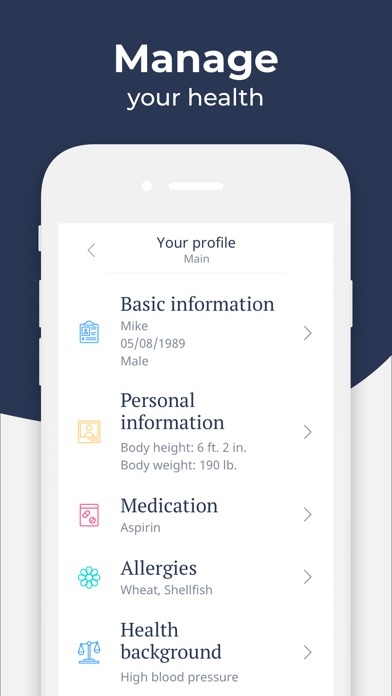 This app is not a Medical Diagnosis, this is only an app that gives you a possible illness of what you have. This app helped me link my symptoms to a possible case, and when I asked the doctor, he said the same thing. (It was the common cold) I highly recommend this. Very accurate and helpful to use. I had this for quite a while and I’m happy to hear what I can do to relive my pain. I don’t normally write reviews but about a year ago I was in a super dark place, and this helped me overcome it. I’ve been feeling very depressed again recently so I decided to get this app again and it really does help. For those of you out there who are depressed or suicidal, this app helps. It’s super reassuring and just helps me out a lot. 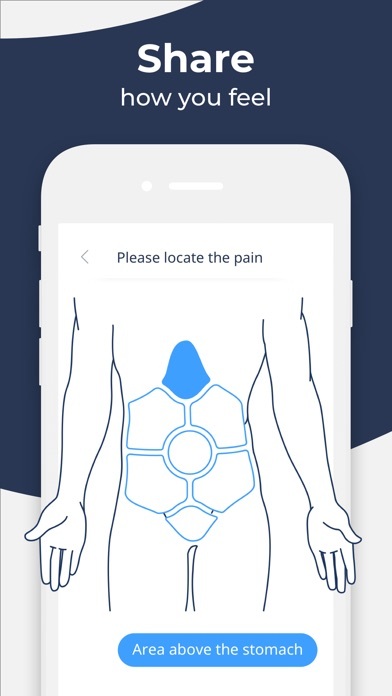 I don’t really write reviews but this app is really good for determining what could be the cause of pain/sickness. This app was extremely helpful because I was feeling depressed and when I was seeing what it was it told me something heartfelt and it made me feel important and worth something. I give it 5 STARS! This app helped me get through my intense altitude sickness and i really enjoy the simplicity and soothing nature of the app. Thank you Ada! You were very helpful! As of March 9th, this is Year 4 since my operation! I have had pain each day/all day for 4 yrs. However, I am grateful to be alive after a 9 hour surgery! Again, thank you to my new friend, Ada! I have been feeling the same symptoms for the past several months, and today I decided to try this app. It turns out, that the app came up with the same diagnosis as my doctor’s, with the exception of anxiety. Not too bad of an app. I recommend it, followed by a doctor’s appointment, no exception or excuse. We only hurt ourselves and loved ones by delaying treatment. Honestly and an ability to describe the symptoms will turn this into a great tool. This was my first time using the app but I found it really helpful! I’ve used this as a helping tool to help try to get an idea of what I have before going to get help and it’s almost always correct it gives so much information and tips to help with your problem!!!!!!!! It is pretty accurate. Easy to read, and understand the results. The app gives you a couple of reasons what the problem can be. You look it over and think if that is what it is. Very happy, shared the app with my kids! ¡Amo esta app! Cada. Es que me siento una molestia recurro a ella y al ir a mi médico me confirma el análisis, me encanta saber que tengo con quien consultar en cualquier momento en caso de emergencia ya se que hacer. 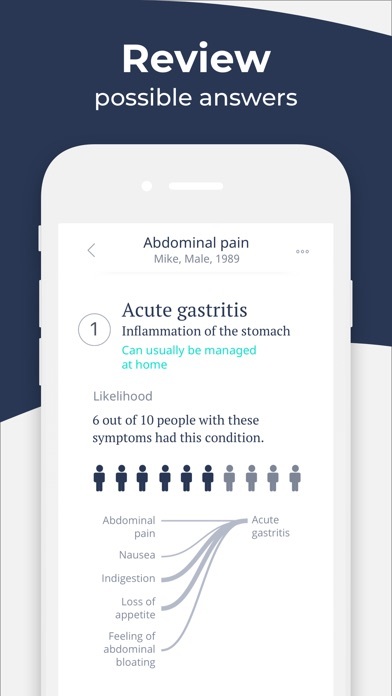 I have been amazed at the ability of this app to ask the right questions to narrow down possible health conditions. Highly recommend. By Anastsia is getting better! This app works wonderfully but the only problem that I have noticed thus far is that there is no location for me to input conditions that I know that I have. I have been diagnosed with a few conditions and I think that it might be helpful to the app if those were known.